The Buddha may be either standing, sitting or walking. 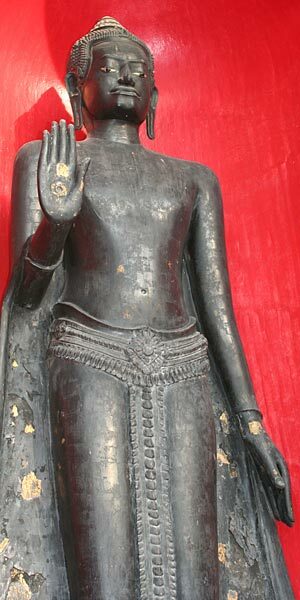 Seated Buddha Image, displaying the Hand Gesture of Abhaya Mudra. 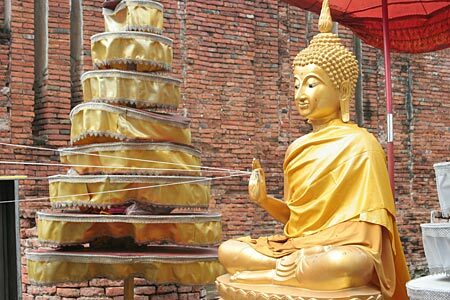 The Buddha Image is holding threads connected to various parts of the Ubosoth (part of religious ceromony) at Wat Thammikarat, Ayutthaya. In the style of the Lopburi period. Image present in the courtyard behind the Ubosoth at Wat Benchamabophit, Bangkok. Walking Buddha image with the gesture of Imparting Fearlessness.